The Australian Venom Research Unit in collaboration with the Charles Campbell Toxinology Centre (University of PNG) operate a Snakebite Clinic in the Emergency Department at the Port Moresby General Hospital. This clinic is the only facility of its kind in Papua New Guinea, and provides 24 hour-a-day access to specialist treatment of bites and stings by a wide range of venomous animals. The clinic treats between 11 and 43 patients each month, with a focus on ensuring that all patients are managed according to a standardised protocol. This ensures that as soon as a diagnosis of snakebite envenoming is confirmed, antivenom is administered without delay, and airway and breathing problems are expertly and promptly treated to reduce morbidity and increase patient safety. Clinicians interested in gaining experience in the treatment of snakebite in our clinic are encouraged to get in touch with our team to discuss the available opportunities. CSL Snake Venom Detection Kit including contents and packaging. Australia is the only country in the world that has snake venom detection kits.They consist of a rapid two step enzyme immunoassay in which wells are coated with antibodies to the various snake venoms. 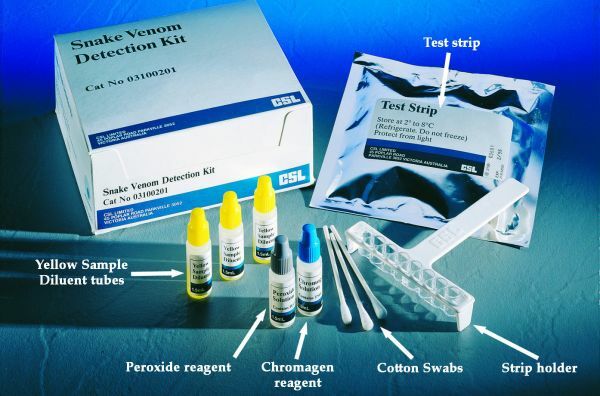 A swab from the bite site, blood, or urine helps to select the type of snake antivenom which may have to be used. Note that the primary purpose of the venom detection kit is not to decide whether envenomation has occurred (i.e. whether antivenom is indicated), but to help to choose the appropriate antivenom if required. A positive VDK result is not an indication for antivenom. Venom detected at the bite site may be present in insufficient quantity in the circulation to cause significant illness. A negative VDK result does not mean that envenomation has not occurred. The venom may have been washed off or diluted at the bite site, or may not have reached the urine, but still be present in the circulation. Bite site swabs are considered to be the most reliable sample for use in venom detection kits. Venom may also be obtained from clothing, or even from the fangs of dead snakes. Note that very high concentrations of venom in the sample may cause inaccuracies in the venom detection kit result. If this occurs, the sample should be diluted and the test repeated. Blood and urine samples may also be used in the venom detection kit, but are generally thought to be less reliable than bite site swabs. Urine in particular may be used if there has been some delay in presentation, or if no bite site can be identified. Venom Detection Kits should be used in conjunction with other information (such as clinical presentation, knowledge of snakes in the geographic area, identification of snakes brought to hospital with the patient) to determine which antivenom to use if the patient is significantly envenomed. If a reliable identification cannot be made,then polyvalent snake antivenom (or the appropriate combination of monovalent antivenoms in Victoria and Tasmania) should be used. Australian antivenoms are amongst the safest in the world. Many patients, even those with a past history of reaction to equine proteins, such as snake handlers, have had minimal or no problems with repeat antivenom therapy after premedication. They are, however, foreign protein, and the possibility of allergic reactions, including life threatening anaphylaxis, should always be considered and facilities be made available for dealing with such complications before the administration of antivenoms. Adrenaline is the treatment of choice for anaphylactic and anaphylactoid reactions, in conjunction with bronchdilators, fluid replacement etc. Most antivenoms are given by the intravenous route, although redback spider antivenom and box jellyfish antivenom are more often used intramuscularly. Skin testing for allergy to antivenom is not recommended, as it is unreliable and may delay urgent therapy. Antivenoms that are given intravenously should be diluted in at least 100ml of N. Saline, 5% dextrose or Hartmann’s solution immediately prior to administration. It should initially be administered slowly while the patient is observed for signs of allergic reaction. If no reaction is observed, then the rate of infusion may be increased. If the patient reacts to the antivenom, the rate may be slowed or the infusion ceased temporarily. If the reaction is more severe, then treatment with adrenaline, plasma volume expanders and beta agonists should be undertaken as required. The decision to recommence antivenom should be based on the clinical state of the patient. In the case of the patient with a known allergy to antivenom or to horse serum, the decision as to whether to withhold antivenom should again be clinically based, bearing in mind the resuscitation facilities available. The initial doses of antivenom recommended are based on the average amount of venom injected by each of the snakes concerned. There is evidence, however, that these doses may be insufficient to reverse coagulopathy associated with the bites of several Australian venomous snakes, notably the brown snake and the taipan. Larger initial doses should be considered if there is evidence of severe envenomation (multiple bites, rapidly progressive symptoms, large snakes). The dose of antivenom for children should not be reduced according to their weight, since the amount of venom injected by the snake is independent of the victim’s size. Note: the antivenom requirements of patients will vary considerably. Some patients with minimal envenoming will required no antivenom, whereas others may require multiple doses of antivenom. Detailed information on the use of antivenoms is packaged with the individual antivenoms. If you require additional advice, contact the Information Centres on 13 11 26 (Australia wide) or CSL Ltd on (03) 9389 1911. White, J (2013) A Clinician's guide to Australian venomous bites and stings: Incorporating the updated CSL antivenom handbook. CSL Limited (Australia). Australian Resuscitation Council Guidelines, section 9.4: First Aid Guidelines-Envenomation. https://resus.org.au/guidelines/ accessed 25 Sept 2016. Sutherland SK, Coulter AR, Harris RD. The rationalization of first aid measures for elapid snake bite. Lancet 1979;1: 183-6. Sutherland SK, Coulter AR, Harris RD, Lovering KE, Roberts ID. A study of the major Australian snake venoms in the monkey (Macaca fascicularis). 1. The movement of injected venom, methods which retard this movement, and the response to antivenoms. Pathol 1981;13: 13-27. Cox JC, Moisidis AV, Shepherd JM, Drane DP, Jones SL. A novel format for a rapid sandwich EIA and its application to the identification of snake venoms and enteric viral pathogens. J Immunol Methods 1992;146: 293-294. Howarth DM, Southee AE, Whyte IM. Lymphatic flow rates and first-aid in simulated peripheral snake or spider envenomation. Med J Aust 1994;161: 695-700. Sutherland SK, King K. Management of snake bite in Australia. Royal Flying Doctor Service of Australia Monograph Series No.1. 1991. Sutherland SK, Leonard RL. Snake bite deaths in Australia 1992-1994 and a management update. Med J Aust 1995;163: 616-618. Sutherland SK, Duncan AW. New first-aid measures of envenomation: with special reference to bites by the Sydney Funnel-web spider (Atrax robustus). Med J Aust 1980;1: 378-9. Hartwick R, Callanan V, Williamson J. Disarming the box-jellyfish. Nematocyst inhibition in Chironex fleckeri. Med J Aust 1980;1: 15-20. Exton DR, Fenner PJ, Williamson JA. Cold packs: Effective topical analgesia in the treatment of painful stings by Physalia and other Jellyfish. Med J Aust 1989;151: 625-6. Cogger HG. Reptiles and Amphibians of Australia. AH and AW Reed, Sydney. 1983. Covacevich J, Davie P, Pearn J. (Eds) Toxic Plants and Animals: A Guide for Australia. Brisbane: Queensland Museum. 1987. Edmonds C. Dangerous Marine Creatures. Reed Books, Frenchs Forest, NSW. 1989. Gow GF. Snakes of Australia. Angus and Robertson, Sydney. 1976. Mascord R. Australian Spiders in Colour. AH and AW Reed, Sydney. 1983. Meier, J. and White, J. Handbook of Clinical Toxinology. Mirtschin P, Davies R. Snakes of Australia: Dangerous and Harmless. Hill of Content, Melbourne. 1992. Morrison JJ, Pearn JH, Covacevich J, Nixon J. Can Australians identify snakes? Med J Aust 1983;2: 66-70. Sutherland SK. Venomous Creatures of Australia. Oxford University Press, Melbourne. 1994. Tibballs J. Diagnosis and treatment of confirmed and suspected snake bite: implications from an analysis of 46 paediatric cases. Med J Aust 1992;156: 270-274. Tidswell F. Researches on Australian venoms, snake-bite, snake venom and antivenine, the poison of the Platypus, the poison of the red-spotted spider. N.S.W. Department of Public Health, Sydney 1906. Underhill D. Australia's Dangerous Creatures. Reader's Digest. 1987. Weigel J. Guide to the Snakes of South-East Australia. Australian Reptile Park, Gosford. 1990.